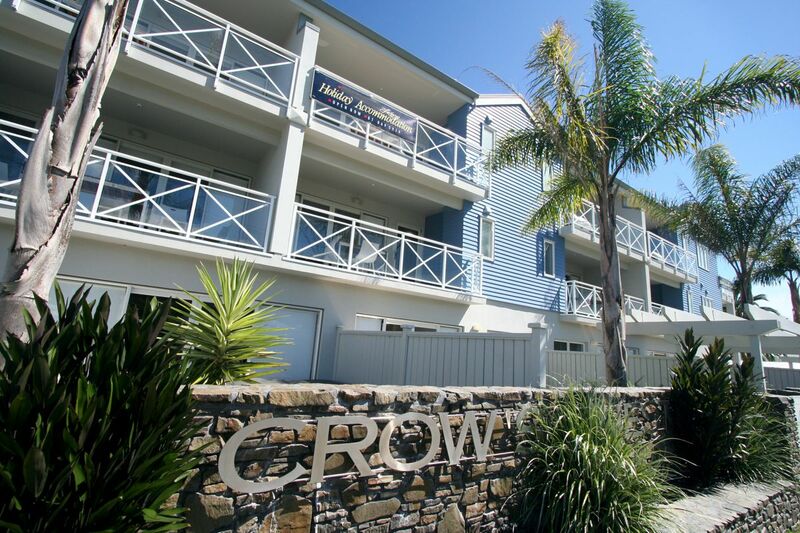 The Crow’s Nest Apartments is a 4.5 star, three level apartment complex a short walk from Buffalo Beach, the main beach in Whitianga. Walk just 50 metres and you are on the lovely boardwalk that wraps the entire way around the waterfront, from the wharf at one end to Brophy’s Beach at the other. The apartments are superbly located close to all amenities but set back from the main street giving it a more peaceful setting. They are within walking distance of restaurants and cafes, the wharf and ferry and the main street of Whitianga, Albert Street. Great for a couple on a weekend getaway, couples travelling together, business people travelling for work, families of all sizes and groups. Speak to us about our multi-apartment discount when you book. We also have wheelchair accessible ground floor apartments. Please ask for more details and availability. For Christmas, New Year, Scallop Festival Weekend and Auckland Anniversary Weekend – we require a non-refundable 50% deposit which will be charged to your credit card one month before your stay. All other bookings require your credit card details to secure your booking. We will not charge your credit card prior to your arrival, the full amount is due on check-in. Cancellation fees are at the discretion of Crow’s Nest Apartments Management. You can cancel free of charge until 3 days before your arrival. (This is not applicable if you have paid a non-refundable deposit). If you cancel within 3 days of your arrival, a minimum charge of one night’s tariff (up to 50% in the peak season from Dec-Feb) will be debited against your credit card plus an administration fee of $25.00. For no shows, your credit card will be charged the full booking amount. Both of us spent our early years growing up in Whitianga before moving to Auckland to seek new opportunities. Even though we were living in Auckland, we still came home to Whitianga every chance we got, visiting Mark’s parents who retired here. After spending 12 years in Auckland in the hustle and bustle we sold up everything and moved back to the place we have always called ‘home’. We welcomed little Elias to the Crow’s Nest team in March 2017 and expanded the team again in July 2018 with the arrival of our wee girl Gracelyn (we’ll update the photo soon 🙂 ). We have always taken great pleasure in bringing our friends to this magical place called Whitianga and having them enjoy all of the things to see and do here. When the Management Business at The Crow’s Nest Apartments came up for sale we thought this would be a great opportunity for us to continue sharing our love for Whitianga and the Coromandel Peninsula with all of our guests. Our goal is to develop The Crow’s Nest into a family and couples focused place to stay where guests can relax, unwind and enjoy what the Coromandel Peninsula has to offer. We had a great welcome from the managers of the apartments who looked after us very well. The apartment was very well appointed with all the modern fittings and cooking facilities which was a pleasure to stay in. The beds were very comfortable and we had a lovely view seawards. Certain great value for money and will return again in the future. Service was amazing, room was clean and well eclipse and great location. I would stay there again in a heartbeat. There’s a fantastic rooftop deck, bed was comfortable, incredibly spacious and an all-around enjoyable stay. This is our 2nd visit to Crows Nest in Whitianga, and will definitely come again. Close & convenient to all amenities (we walked everywhere we needed), and very helpful staff. When coming to Whitianga, you need to have this place on your list. We were so thrilled to find our top floor apartment was actually a 2 bedroomed one and was amazingly well equipped. We had a full kitchen with 2 dishwashers if you please, a very large fridge freezer, cooker etc. In the hallway was a washing machine and a tumble drier too. Washing powder and dishwasher powder etc was also provided. Everything was of excellent quality and in full working order. The secure car park as Wi-fi we’re exc too. Both Kylie and Mark have worked so hard to build this business back up after a previously poor management company let it decline very badly. Great position with some water views and handy for supermarkets and the little port. Highly recommend.